While most people on holiday like to try to unplug a bit, it’s also very likely, especially if you’re on a longer holiday, that you might need to check work email, pay bills online or just want to surf the Internet. The best, and most likely, sources of free WiFi happen to be cafes. Luckily Byron Bay has loads of excellent places to sip on amazing cups of coffee and connect your laptop or tablet and log a few hours of work or just connect to the outside world. Conveniently located near Main Beach, you could sneak away from the rest of your group and snag some WiFi here at a the popular Espressohead. Espressohead, or ‘E Head’ as some of the locals call it, is one of the longest continually running cafes in Byron Bay, so you won’t be disappointed with the food, coffee or Wifi. So check out Folk and know you’ll have a great connection to WiFi, can work as long as needed and grab some good coffee and delicious treats. According to a reviewer on Yelp, you won’t be disappointed if you try to connect to the Internet here. “This was a GREAT cafe, superb coffee, friendly service, blazing Internet without the nasty limits. Highly recommended!” said the reviewer. Mokha Cafe, situated in the Byron Bay city centre on Lawson, serves up good coffee and food — plus it serves up cocktails later in the day, so don’t feel like you can only head here in the morning. It’s an all day option for WiFi! Not only will you be able to log onto the Internet for free here, you’ll also have a chance to score some excellent cheap food. Several reviewers on TripAdvisor noted the availability of free WiFi at Manna Haven. So not only do we recommend this Byron Bay restaurant, but so do many reviewers on TripAdvisor. So if you’re looking for a place to catch a few hours of free WiFi and nosh on delicious food, head over to Manna Haven during your holiday. Guess what? This last one makes it super easy for you to do a quick check in on work email or other matters, simply by using the complimentary WiFi available for guests at Broken Head Holiday Park. Need to send an email to a client urgently? Make a quick change to a file? Just log onto our free WiFi and take care of your issues. Once you wrap up, shut off that computer and get back to your awesome holiday in Byron Bay. 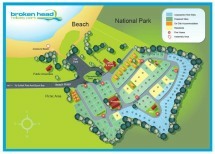 No matter if you need five minutes, several hours or daily access to WiFi while on your holiday, not only does Broken Head Holiday Park have you set, but so does the Byron Bay Area. You’ll find plenty of places to connect while you’re visiting, and then you can get back to the business of enjoying your trip. As we look forward to the holidays, don’t worry about being cut off, you can stay as long as you want and still be able to take care of work as well. So don’t wait any longer, start planning your holiday to Byron Bay now!